When plantation owner Timothy Reid, Sr. (Morgan) dies, his son Timothy, Jr. (Breen) inherits the plantations and all of the slaves. However, lawyer Martin Dill (Maxwell) is the executor of the will and begins selling the property and keeping the money for himself. When Timothy learns Dill plans on selling all of the slaves, who were never sold or beaten during the life of Reid, Timothy enlists help from friendly inn owners to prove Dill is corrupt. -The film was written by Clarence Muse-who was in the film-and poet, writer and activist Langston Hughes. Several of the songs were also written by Muse and Hughes. -This film is credited as the first mainstream film written by an African American, according to the book “EVERY STEP A STRUGGLE: Interviews with Seven Who Shaped the African-American Image in Movies” by Frank Manchel. -Clarence Muse wrote a book called “Way Down South” and producer Sol Lesser wanted to use the title so he bought the book from Muse. The original 1932 book portrayed slaves in a dignified manner. “He didn’t use any of the stuff on the inside. Then he paid me to do the ensemble, and I wrote the screenplay with Langston Hughes. It came out and we had a ball,” Muse said in an interview published in Manchel’s book. If you have ever seen little known B-film “Way Down South,” you can say you have seen a film written by celebrated writer and activist Langston Hughes. 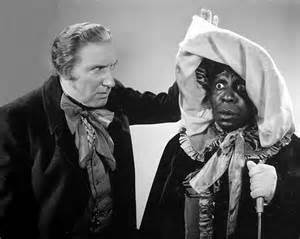 Clarence Muse dresses as Bobby Breen’s aunt as he tries to help him escape. Made in the grand year of 1939, this hour long B-musical is nothing to write home about and is most interesting because of it’s screenwriters Hughes and Muse. One of the screenwriters, Clarence Muse, also was one of the leads in the film. Langston Hughes was criticized for his involvement in this film, however. Hughes did not defend any racial representations but noted that he tried to highlight morals. He got involved with the film so that he could pay for his mother’s cancer treatments and her funeral, as well as other debts. It also allowed him to buy his first new clothes in three years, according to Which Sin to Bear? : Authenticity and Compromise in Langston Hughes by David Chinitz. 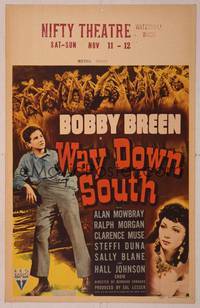 This movie was my first introduction to singing child star Bobby Breen, who acted in films from 1936 to 1942. 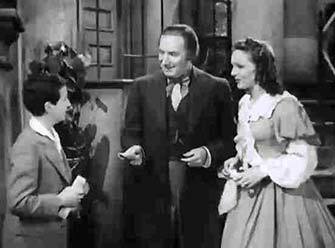 I wasn’t a huge fan of Breen’s acting or singing, but it was interesting to be introduced to another child actor of the golden era. Though Breen’s singing didn’t grab me, the performances from the Hal Johnson choir are beautiful. Along with Muse, Alan Mowbray’s role as a New Orleans inn owner was one of the more interesting characters. We also see Loretta Young’s sister, Sally Blane, in a very brief role as Mowbray’s wife. It’s always interesting to discover forgotten films from Hollywood’s most celebrated year but this one is simply worth seeing due to its two screenwriters. This entry was posted in 1939, Musical Monday and tagged Alan Mowbray, Bobby Breen, Clarence Muse, Langston Hughes, Musical Monday, Sally Blane by Jnpickens. Bookmark the permalink.